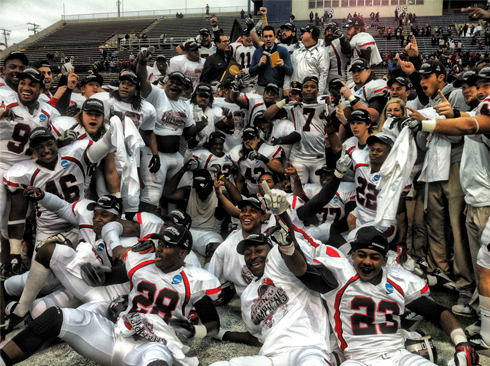 Florence, Ala.-The Valdosta State Blazers (12-2) are bringing another title back to title town. The Blazers crowned themselves 2012 Division II national champions after beating Winston Salem State (14-1) 35-7 in the championship game Saturday afternoon. With the game clearly out of reach late, the celebrating started early on the sidelines. As soon as the game officially came to an end, the swarm of raving Blazer supporters rushed the field in excitement to congratulate team. Even though this is VSU head coach David Dean’s second championship title victory in five years, he is quick to deflect the attention to his players for the accomplishment. Blazer true freshman running back Cedric O’Neal’s impressive 143 yards effort and forcing the Rams into six turnovers (three interceptions and three fumbles) helped push the VSU football team to its third championship title. Blazer quarterback Cayden Cochran’s family house burned down less than a week ago yet in the emotional game he completed 18 of his 26 passes for 109 yards and recorded three touchdowns. VSU started the season finale in great fashion with a 96 yard opening kickoff return by Matt Pierce. 12 seconds into the contest the Blazers not only took the lead but the momentum they needed to boost them for the rest of the entire game. The Blazers doubled their lead on their first drive of the game a couple minutes later. VSU picked up back to back first downs on the scoring drive before on a fourth down call to leave the offense on the field, O’Neal found daylight for a 24- yard touchdown run. The Rams just minutes into the game already were losing by the most points they had all season. This was the fifth game of the season where O’Neal rushed for over 100 yards and the Rams hadn’t given up that many yards to a single runner in a game all season also. The Blazers entered the second quarter up 14-0. On the Blazers first drive of the quarter they marched downfield to extend their lead more. During the 72 yard drive, redshirt freshman running back Austin Scott eclipsed the 1,000 yard mark for the year marking the first time in VSU history to have two 1,000 rushers in the same season. Scott’s tandem mate O’Neal gained 30 of his 80 first half rushing yards on this drive before Cochran punched in the one yard keeper. VSU took a commanding 21-0 lead minutes away from halftime. The Rams would make a late march downfield attempting to score a touchdown before halftime but to no avail stopped by the Black Swarm inside the VSU five yard line for one of the Rams four turnover on downs. Blazers led 21-0 at the half. Minutes into the third the Rams ended the shut out conversation. It took less than two minutes to complete a 80 yard drive that cut the deficit. WSSU quarterback Kameron Smith found receiver Jameze Massey for a 29 yard touchdown after converting their first fourth down attempt of the day. 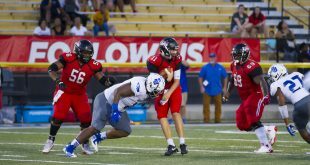 Blazer linebacker Jeremy Grable’s forced fumble on the Rams next possession was crucial and helped VSU maintain momentum when it seemed to be fading. The play came following a Rams strike downfield getting all the way to the end zone before Smith was stripped on a keeper and recovered for a touchback by Blazer linebacker Chris Pope. “That was a huge play. We had just scored a touchdown and had the momentum and the wind. We had them on their heels. If we could have punched that in…no telling what could happen. But we didn’t get it done. They made a great football play and recovered. It was very deflating,” said WSSU head coach Connell Maynor. A 17-yard touchdown pass from quarterback Cayden Cochran to Quinn Roberson early in the fourth quarter erased any real last hope for the Rams. Cochran’s touchdown keeper late following a WSSU muffled punt recovered by VSU was the nail in the coffin and sealed the victory. “It’s an unbelievable feeling. I’ve been on past teams where I thought we were working hard and I thought we had team unity, I’m telling you right now. I’ve never seen such a tight unit with his team and these coaches, and it’s unbelievable,” said Cochran. VSU has now won three national titles in the last 19 months (2012 softball and men’s tennis in 2011).